This 2006 report documents the fact that poorer states receive less in education funding, while poorer districts within states receive lower funding, and that poorer schools within districts are under-funded. 1/7/09 – We recently discovered some data errors in the 2008 edition of The Funding Gap and are working to correct them and then repost the report as quickly as possible. 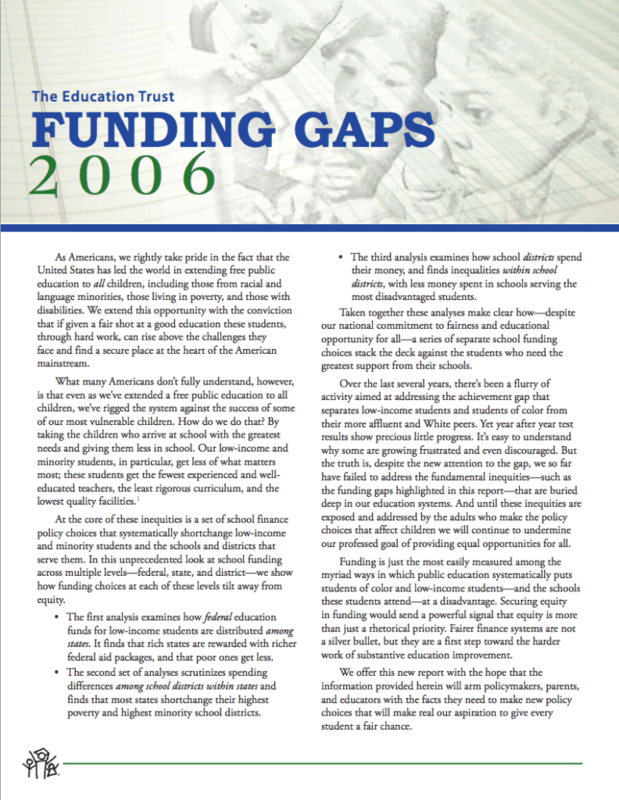 In the meantime, the 2006 edition is our most up-to-date and comprehensive report on state funding gaps. Please check back soon for the updated 2008 report. We apologize for any inconvenience. For more information, please contact Christina Theokas at ctheokas@edtrust.org.